rotaheadrx7 had the most liked content! you forgot the AU on the website address. 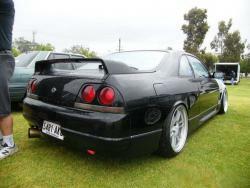 Wish origin did more for the r33, i already have the fenders. Trying to bring it back... Obviously on a street car I would be running a OEM Type manifold, probably internal gate, and a few other bits to look more OEM. Today I think they'd care more about the full cage, sheetmetal interior and single seat, 40mm ground clearance and the 18x12 VSKF's out back. Still rego'd but I haven't driven it for two years. Close though. Forged RB25, with GReddy TD06 20g 10cm turbo kit, should make around 350kw on final tuning. I had one fitted in my HQ ute with a Vortech Supercharged injected 304. I paid $50 of a wreck on gumtree too. Had lines made by pirtek for the conversion, ran it as is, and then put a restrictor in the line, was way too much assistance with open lines. I also had an upgraded alternator, may be an idea. Had my auto sparky make a new loom to suit as well. There is plenty of how to guides on the web though, this is a pretty popular conversion in the UK. Mine was mounted under the guard at the front, with the bracket mounted onto the chassis rail. There's a couple of different type I believe, different mounts and reservoirs. If you have to use a different pump from OEM, it's definatley the way to go. Same here, I tried champix, and took it up again after 6 months, then I tried champix again, and haven't had a smoke for nearly 3 years. Don't even think about it now. Make : NISSAN SKYLINE Transmission : Manual Kilometres : 149000 Price : $13,000 Condition : Used Looking to sell my 1994 R33 Type M Skyline. Bought the car just over 12 months ago completley stock bar a set of 17's and blown coilovers. I've added everything in the last 12 months, so all parts have very minimal use on them. Majority have less then 5000kms. I have almost all receipts for what ive bought and what work ive had done, and it's many thousands of dollars, more than the asking price. I'll get the bad points out of the way first... Both front fenders are munted. Previous owner rolled them REALLY badly, and the D/S has a couple of dents. Has a couple of carpark scratches and dents. Roof, bonnet and top of rear bumper have clear coat fade, but polish up ok. However does require respray to fix. It's all cosmetic issues, which was all I had left to finish, once the mechanicals/driveline had been sorted. Get a pair of 25mm FRP front fenders and have the car blown over in the factory colour and it's done. Was quoted between $1000 - $1200 for a decent closed door spray in OEM black, you could spend more for a REALLY good job, or if you know someone who can do it you're golden Now the good stuff... Car is religiously maintained, using only the best gear (Nulon oil, redline gearbox and diff oil, ryco filters, Caltex 98 octane fuel) and also upgraded with the best parts money can buy. All work not done by myself has been performed by Shaun @ Boostworx, and he can also be contacted in regards to the car. Also in the last 12 months ive replaced timing belt, cam seals, water pump, tie rod ends, lower control arm and knuckle bushes, all the belts, and had air con fully serviced and regassed. Car also has a Viper 2 way paging remote alarm with remote start. It's a perfect streeter, absolute weapon to drive, hit 3500 rpm and its all over the street, but super easy to commute in day to day traffic., it's just become impractical for me to keep, and have other projects on the go that I would rather finish. Body Type M Front bar/sideskirts/pods/wing, 8000K HID kit Interior Bride Digo-R seats in black/gradation on bride rails (Both Genuine with receipts) Nardi Classic Steering wheel/Sparco Detachable hub kit/Yashio Factory shift knob HKS Boost/oil temp/oil pressure gauges in Border Gauge pod, Yashio Factory Water temp Meter (To be installed) Kenwood Head Unit/Splits Engine / driveline Rebuilt RB25 motor - CP Pistons/ARP Hardware/Greddy Metal Head Gasket - Full reciepts for engine build - over $10K worth. APEXi Pod Filter/ Z32 AFM/Stainless inlet pipe (Have another intake pipe with no connection for emissions) Trust TD06SL2-20G 10cm turbo/GReddy High-mount Stainless Manifold/Tial MV44 Wastegate/Braided oil and water lines Plazmaman FMIC And piping 1 piece dump/front/APEXi 3 inch exhaust (Not too loud, good on the street) Nismo fuel pump/Nismo 550cc injectors APEXi Power FC ECU tuned by Shaun @ Boostworx - 270rwkw @ 19psi with dyno sheets. More in it with a decat pipe and some cams. Nismo GMAX twin plate clutch/Braided clutch line/urethane gearbox mount/Nismo pivot ball Nismo 2 way LSD, alloy diff mounts Alloy radiator/Silicone Hoses/Nismo Thermostat/N1 water pump HKS oil cooler kit with filter relocation Optima Dry Cell Battery Wheel and Tyres Enkei RPF1 wheels in silver, 18x9.5 -5 and 18x10.5 +10 215/40 and 235/40 Tyres Suspension setup - FRONT Cusco Comp S coilovers – 10kg Cusco Adj. Upper arms Cusco Adj. tension Rods Nismo Tower Bar w/master cyl. brace Suspesion setup - REAR Cusco Comp S Coilovers – 8kg Cusco Rear upper arms with eccentric lockouts Cusco Cradle collars HICAS lock bar turbo Im asking $13,000 negotiable upon inspection, car has current rego with just less than 3 months left. May consider trade for HSV or XR6 turbo as a daily. Contact Ben on 0439 888 043. +1, Been Using Boostworx for nearly 10 years now, Shaun actually tuned my R33 on Friday, and did another great job as well. Dont know TBH. The wheel's were originally polished, and the rotor housings were brand new from mazda so no paint needed to come off. Think I paid about $70 odd per wheel hoop, but they only needed re-polishing. Were in good nick but had some staining and marks but no actual damage. They were 18's as well. Rotor housings were around $75 each but they were bare raw metal. Ill have a hunt today and see if I can find my reciept. Due to VCT? Keen on a set shortly. I have Recaro SPG's (Similar seat to a ZETA) and bought a pair of Bride FG rails for it yesterday, Ill throw them in over the next day or two and take a pic. Everything Ive read suggests that the Bride FG or the NAMS double lock super low rail are the lowest you can go without hacking into the floorpan. You need the low max rails for them to get them real low. I had the same seats in my soarer and and used the LR rails. They're the ones you want.